Life does not stand still. Why should you? 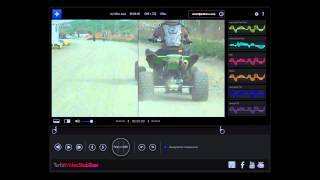 Use Turbo Video Stabilizer to remove shakes, jitters and jellos from your Action Cam videos! How does Turbo Video Stabilizer stabilize my videos? Video stabilization software typically works in three stages: camera motion estimation, motion smoothing or low-pass filtering, and video image warping. Most stabilizers only move in 2 directions. We measure all 6 degrees of motion. After all, when you are zipping downhill on your knobblies, your GoPro cameras are going to be moving in every way! muvee and Microsoft have worked closely together to test muvee Turbo Video Stabilizer for its reliability, performance, and user experience to ensure that the latest version of muvee Turbo Video Stabilizer is compatible with Windows 10. Remove shakes and stabilize your video accurately, Video Stabilization in 3 Axes, 6 degrees of motion; original stabilization engine from Germany used by broadcast studios repackaged for consumers. Smooths irregular pan or zoom shots, making videos look like they are shot professionally on a dolly.